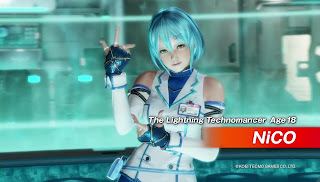 Koei Tecmo has announced a new character for Dead or Alive 6, named NiCO. Dubbed the Lightning Technomancer, the inexplicably 18-year-old scientist shows off her story relevancy and moves in the trailer. Before that, though, the footage also reintroduces Helena's half-sister Kokoro and also scientist Lisa back to the game. Dead or Alive 6 is releasing on PlayStation 4, Xbox One, and PC on February 15.